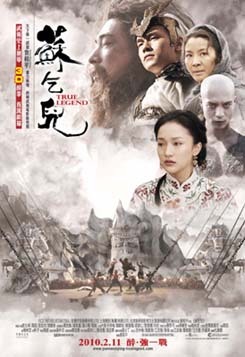 Su Can (Vincent Zhao) is a general who leads a military force to save a prince from a large fortress of enemies in the mountains. In return, the prince promises that the Emperor will make him governor of Hu Bei. Su's step brother Yuan is envious of Su, but Su loves him and asks the prince to make Yuan governor instead. Su wants to leave the military and lead a life pursuing the perfection of Wu Shu, eventually in the hopes of starting his school and teaching his skills. Su gives his great prestigious sword to a comrade Ma, then tells Yuan of his plans. Yuan expresses that he is always in Su's shadow but accepts the governorship. Early next morning, Su leaves on a horse.Five years later, Su and his wife Ying (Zhou Xun) (Yuan's sister) have a child, Feng. Su's father informs them that Yuan is returning from the military to be a governor. He warns Su that Yuan may not have come back simply to reconcile with family but to seek revenge. This is because years ago, Su's father killed Yuan's father when the latter went too far in learning a evil martial arts technique called the Five Venom Fists. Su's father then took Yuan in, but he harbors concern that Yuan is still vengeful. Su is naive and assures his father that everything will be alright.When Yuan returns, a homecoming party is held. Yuan greets his sister Ying, Feng, and Su's father. Su's father knows what is impending and asks Yuan to take his revenge on him alone, sparing Su and his family. Using his mastery of the Five Venom Fists, Yuan kills Su's father and decapitates him. He expresses his desire to be with his sister (Ying) and her son Feng as a family. When Su hears the news of his father's murder, he rushes to the scene of his father's death and is attacked by the Iron Twins. He chases them to a rapid where Yuan is offering Su's father's head to his real father as a symbol of revenge taken. A battle ensues between Yuan and Su. Yuan has a dark armour sewn into his body, making him partially invulnerable to blades. Using his Five Venom Fists, Yuan deals a deadly poisonous blow to Su who is defeated. Feng begs for Su's life and Yuan spares him but throws him into the rapids. Ying jumps into the rapid to save Su and Yuan is heartbroken at the loss of his beloved sister. He takes Feng in as his only family.Ying awakes in forest area and tries to bring her husband to civilization and safety. They are found by a herb researcher and wine maker, Dr. Du (Michelle Yeoh), who treats Su's wounds. Su comes to consciousness but is broken to find his right arm severely weakened with all tendons torn. At first, he is desperate and turns to drinking, but with Ying's support, he focuses on training in order to save Feng. He meets Wu Shu God (Jay Chou) and an old sage and asks to be their disciple. At a sacred site, he trains with the Wu Shu God for years, always trying to defeat him but never able to. Later, by checking Su's pulse, Dr. Du reveals to Ying that Su is going mad and that there is probably no Wu Shu God or Old Sage since she is the only one living in the area. Ying follows Su into the forest one day and finds him fighting (seemingly) with himself, oblivious to the fact that he is only battling with the Wu Shu God in his mind. Ying pleads with Su to come to his senses but he does not believe her. By the time Su realizes the truth, it is too late. Ying has left to try and save Feng by herself.At Yuan's palace, Ying is now a captive of Yuan. Su arrives shortly after and fights his way through the guards. He also battles the Iron Twins and with his improved skills, impales both on a satay, a saber-like spear. Yuan orders his men to bury Ying alive in a box and then kills the men who buried her so that only he knows her location. A crazed Su battles with Yuan in his training chamber and ultimately defeats him, even gnashing though a poisonous snake in the process. Feng screams that Yuan must not die because only he knows Ying's location, but a maddened Su delivers a fatal blow to Yuan's throat, thus executing him in anger. Realizing the words of Feng, he rushes out and a dying soldier reveals the vague location of Ying. Su and Feng rush to search for her but manage to dig her out too late. Ying dies from lack of air.The era changes from the dynastic to the colonized. Su has lost his mind after the loss of his wife and the previous delusions he had. A homeless Feng leads his father through the streets by rope and takes care of him. A Kung Fu master is killed in a fighting arena - part of a foreign (caucasians) club - leaving Su's old friend, Ma, as leader of the Wu Shu Federation. The arena is a stage below which tigers lurk freely, waiting for any unfortunate fighter to drop below.In the meantime, Su goes into an inn and creates trouble by stealing wine and countering people bent on stopping him with martial art moves. He then meets a fellow drunkard (Wu Shu god, Jay Chou in disguise) who spars with him and gives him a few philosophical tips. The two of them start using Drunken Fighting (Zui Quan) techniques, and Su regains his sanity. The inn lady calls Ma to deal with Su and Ma recognizes Su. They have a talk and Ma gives Su back his sword. Su asks Ma to take care of Feng since he is unfit to be a father but Feng persists in the boy (Feng) staying with his father instead.The next day, Su and Feng show up to support Ma in his arena battle. Su goes about drinking in the club's bar area, oblivious to Ma receiving a serious beating in the ring. When Feng tries to save Ma from being killed, the opposing wrestler grabs Feng and holds him in the air. Feng screams for help from his father. His son's cries awake Su from his drunken state and Su rushes into the arena. As Ma and Feng are being taken out of the arena by bystanders, Su battles and defeats the wrestler. Anthony, owner of a wrestling stable, orders his lot to pour into the arena, resulting in a mismatch of three wrestlers to one (Su). Using the drunken martial arts technique learned from his fellow drunkard in the inn, Su's defeats the fighters although he is heavily injured. At the end of the battle, the other fighters are either dead or unconscious, and only after a vision of Ying and the dramatic cries of Feng in an otherwise silenced arena, does a semi-conscious Su manage to stand up. He is declared the winner.The film ends with a seemingly restored Su practising his moves of old but with long hair reminiscent of the insane period of his life, with Feng observing. Su has seemingly found his passion.